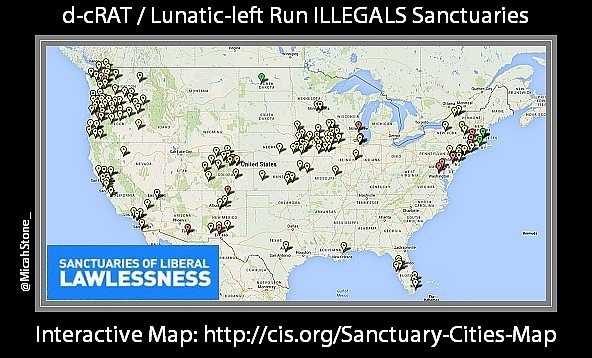 In order to better inform Americans about the impact illegal aliens are having on crime rates in sanctuary cities, President Donald Trump [yesterday] ordered the Secretary of the Department of Homeland Security to publish a weekly list of crimes committed by illegals. 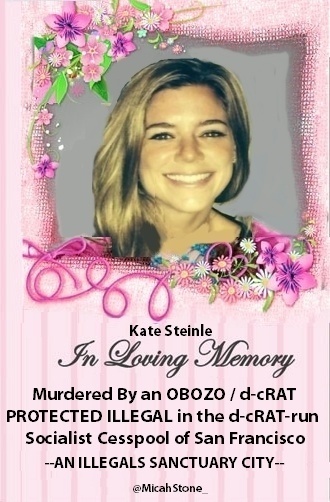 I’ll see your sobbing anchor baby and raise you Kate Steinle. Killed by an illegal in a sanctuary city. On tips from Bodhisattva and Rob E.
In B4 fake news reports that this executive order might contain language forcing illegal immigrants to wear yellow patches sewn onto their clothes shaped like tacos. ROTFL!!! Yellow taco patches!!! ROTFL!!! On another note, the logic behind sanctuary cities is that illegals will be more inclined to cooperate with police when they are the victim of (or witness to) a crime, thus making community safer. I say that they would not be a victim if they were not here to begin with. And the perp? well he/she was also probably an illegal. Thus no crime would be committed in the first place. Which community is safer? Illegals who cooperate with police in criminal investigations or a community with no illegals to commit crime. I’d say the second. The lawless, criminal, leftist-run cesspools…. This would fix it: Make it a Federal law that all State and local government officials who AID AND ABET illegal alien criminals can be PERSONALLY sued for any damages, including all legal costs. 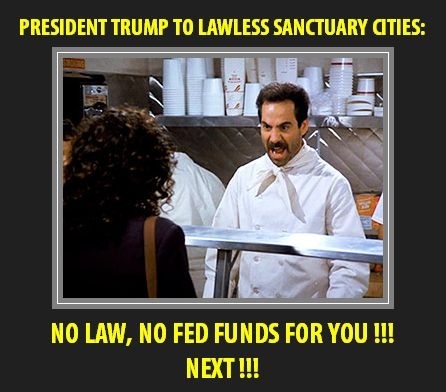 I’d bet that “sanctuary cities” disappear after the first high-dollar judgement is made. Politicians voting to prosecute other politicians may take a while to pass, 3 maybe 4 centuries. We could start today by enforcing 8 U.S. Code § 1324 – Bringing in and harboring certain aliens . . .
A “John’s List” of illegals, I like it, as long as the enabling politicians names / photos are printed right along side of the illegals they enabled. It will make for great campaign ads next election cycle, assuming there is one. I believe that aiding and abetting criminals is already a crime. My suggestion would put the politicians and bureaucrats PERSONALLY on the hook for paying damages to the victims of criminal illegal aliens who were protected by “sanctuary cities”, rather than the taxpayers. criminal acts that are common in their home country. is described as a black male, followed by a physical description. do the best job of turning American streets into a war zone! Ohh, they should be very careful what they wish for. Or maybe just hang them, saves time, money and cuts the recidivism rate waaaay down. Well, perhaps they should be charged as accessories to any crimes committed by the illegal aliens. If the charge was murder, they would possibly face a death penalty.